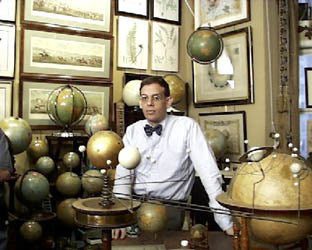 is globes, said George Glazer in what was possibly the best understatement weve heard as we stood in delighted silence taking in his Harry Potter living space filled with what is probably the worlds most extensive collection of American globes as well as a stuffed hornbill and much else besides. And he then he apologized for the dust, which we also loved but he didnt seem to believe us and continued what had obviously been a massive clear out in honor of our visit. Stop dusting, we instructed him. A very serious and passionate collector, he was once a corporate lawyer (I need to defend myself from allegations of hoarding) and he was tremendous fun to talk to. In this age of Google Maps and GPS and Google Earth, why are people still so drawn to these objects, these globes? Well, there are a lot of different reasons but as you just said, it is an object, so even if something is on a computer youre still looking at it on a screen and its reduced to two dimensions. Theres something embedded in our DNA that we relate to itwe dont know why. Its built into our system. Ive never seen anyone walk past a globe and not want to touch it. its deeply embedded. Were used to civilization, thats two or three thousand years ago but if you go back a lot further that, there really wasnt that much there but there were the planets and there was the sun. We havent evolved that much. They had a greater importance at one point and its still with us. What do your customers say to you about why they want to buy a globe? They dont necessarily say these things. Its usually somebody who is interested in collecting and cartography but more commonly its somebody who just wants to buy a gift. Usually there is an angle to it like the person likes to travel. Some people are interested in geography and the antiquated place names. You really have to go back to the 16th and 17th century to see odd shaped landmasses although it is still possible even in the early 18th century to see California as an island. What are the earliest globes? In ancient Greece and Rome you would find some celestial globes in stone  not terrestrial. When you do start to get the earliest concept of the earth as sphere? Oh, I think they knew that in those [ancient] times because of the horizon. The idea of a flat earth was more of a myth. The idea that people believed rather extensively in a flat earth was a myth that was created in the 19th century. I wonder if the Flat Earth Society still exists. Was it mainly in the 19th century that expensive globes really became status symbols? but then neither did Alexander Von Humboldt, who was a 19th century explorer. So what drew you to globes? The way that I do this, whether this is being sort of defensive in my own right or not, is that Im not trying to be Alexander Von Humboldt. Im not trying to be an 18th century English gentleman. I just bought the stuff and it looks like that. Theres this other thing called a German Kunstkammer or wonder cabinet, so the idea of what I have done is not original to me. But in this day and age its very original. Well, its unusual because most people have gone modern. For some reason I love these globes. I like decorative arts. I like objects probably better than art, although I am an art dealer. Theres an extraordinary delicacy to them, the lines, the script, the way they balance and turn. To me everybody should want a globe because it has everything in it. Theyre also scientific instruments. Do men mainly buy them? I mean I dont know a lot of guys who collect quilts. How do you live in this place? I think Im a collector. I need to defend myself against allegations of hoarding. Im trying to put together the worlds greatest collection of American globes, which I probably have already done and youre sitting in it. I like that theyre all dusty. Its fabulous. Its sort of like this is my life and this is what I want to do and I know this place is not like anybody elses place but I dont care. are you British? The British get it much more quickly. Some people are overwhelmed by it. But its really for me. This room in many ways is wonderful and its wildly impractical. Its a Harry Potter room! Do you like those books? So collecting is somehow different from acquisition, is it? Its not just acquisition? youd have to be a psychologist or psychiatrist to really understand it. But now you can buy something online now and it comes in a box and part of the thing [that is lost] about collecting is the challenge of it. eBay and things like that sort of killed a lot of it. It makes it too easy. This is a business but for a lot of dealers its about winning but I am, at heart, a collector. I want to find different things in different places that have a commonality and I want to bring them together. Theres something about the personality of the collector and the relationship to objects that is stronger, more passionate and that other people lack. It is what it is. I do and I dont, interestingly enough. What dont you like about it? Well would happen if you let it go? [Starts to laugh] Now it sounds like Im in psychoanalysis. Nothing would happen. Are you good at reading maps  if Im in a car with you and I hand you the map are you going to find the way really easily?